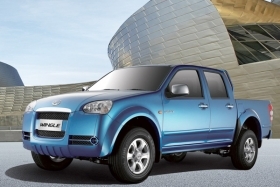 Great Wall is selling a diesel Wingle pickup in Europe for the first time. Great Wall Motor Co., China's largest maker of SUVs and pickups, has begun selling the diesel-powered Wingle pickup in Italy. The automaker shipped 343 units this month, said a company spokesman. This is the first time the company has exported diesel -powered vehicles to Europe. Diesels are popular in Europe and account for about 40 percent of new-vehicle sales in Italy, according to ACEA, the European automakers association. The Wingle's 2.0-liter diesel engine, fitted with Robert Bosch GmbH's common-rail diesel fuel injection system and variable geometry turbo-compressor, can meet Euro 5 emission standards, according to the spokesman. Great Wall will ship another 1,657 diesel Wingles and 300 gasoline-powered Wingles to Italy this year. The European Union certified the gasoline-powered Wingle in 2009 and the diesel-powered Wingle in 2010. Great Wall began exporting the gasoline Wingle to Italy in 2006. The company also exports the gasoline pickup to Iraq, Australia, Chile, South Africa, Algeria, Syria, Uruguay, Russia and Saudi Arabia.